Those suffering from binge eating disorder regularly consume a large amount of food in one sitting but do not regularly purge this food by vomiting or taking laxatives/diuretics, nor do they routinely exercise excessively in an attempt to burn off these calories. Instead, most binge eaters usually become overweight or clinically obese. Of all of the common eating disorders, binge eating disorder is often the least understood so below are some answers to frequently asked questions about binge eating disorder. There is no single known cause of binge eating disorder but is known that, like all eating disorders, binge eating disorder is often linked to low self-esteem and feelings of helplessness and worthlessness. Binge eating disorder has also been associated with people who have suffered sexual abuse, and there is a growing body of research into the link between binge eating disorder and genetics. What are the Signs/Symptoms of Binge Eating Disorder? 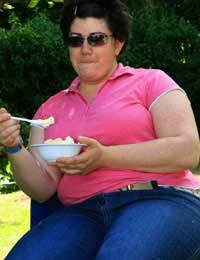 Binge eating disorder is most often recognised by an individual’s eating habits and weight. Often binge eaters will hide the food on which they binge and lie about what they have eaten, but some binge eaters are highly visible in their daily “grazing” and will continue to publicly eat for as long as there is food offered, even when they are no longer hungry or are actually so full that they are in pain. Many binge eaters also voice negative opinions about their appearance, express a desire to lose weight or diet, and avoid exercising in public. Binge eating disorder can occur in individuals of any race, age or socio-economic status, and unlike other eating disorders (such as anorexia and bulimia) in which females are many times more likely to be diagnosed than males, binge eating disorder is diagnosed only slightly more often in females than males. What Are the Health Effects of Binge Eating Disorder? Binge eaters put themselves at risk for a wide variety of health conditions and diseases. Due to their excessive eating, binge eaters are typically overweight or clinically obese and therefore at risk for high blood pressure, high cholesterol, type 2 diabetes, heart disease, stroke, joint and muscle pain and sleep apnea. The large amounts of food consumed may also lead to stomach and gastrointestinal pain, gum infections and cavities due to large amounts of sugar and acid consumed, and constipation or diarrhoea. There is no recognised cure for binge eating disorder, but there are a variety of treatment options that may be used alone or in combination as needed for specific cases. Treatment for binge eating disorder regularly includes counselling/therapy, family counselling/therapy, cognitive behaviour therapy (to change food and eating behaviours), the use of support groups or group therapy, and nutritional counselling and planning. Rarely is medication used to treat binge eating disorder unless it is prescribed to treat an associated condition such as depression or is used to suppress the appetite under medical supervision. Where Can I Find Further Information About Binge Eating Disorder? Further information about binge eating disorder can be obtained from any medical or mental health professional. The Eating Disorder Association and the National Centre for Eating Disorders are also excellent resources for further information on binge eating disorder. Hi, I want to heal from my binge eating disorder as it has claimed so much of my life. I can only do online due to me living very remote. Please help. Hi,I wrote earlier,Along with my severe laxative abuse,I want to know if my vomiting that I have ben doing over the last,Thirtyfive year's could have tore up my throat so bad,That now I can Now I can not hardly talk-And all of the bleeding and scar tissue in the rectal area,Could severe milk of mag abuse cause the scar and severe pain?